When it opened last year in the growingly chic warehouse district south of downtown, St. Kilda became a go-to spot for fresh, colorful and refined breakfasts and lunches; since then, their avocado toast with poached eggs has become legendary. Lesser known, perhaps, is the dinner program, which debuted a few months after the cafe opened. 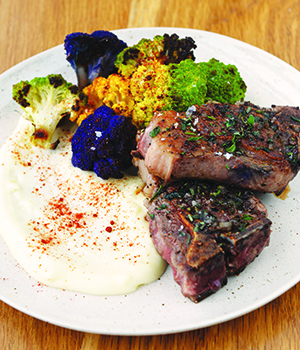 Featuring cast iron-grilled lamb chops drizzled with cognac-butter sauce and served alongside tri-color roasted cauliflower and a celery root and potato puree, this Restaurant Week main dish offers diners an enticing incentive to get to know the restaurant’s under-the-radar dinner menu of uncomplicated yet well-wrought entrees.